The karli is from the bustling Sunday fish market at Khar Danda, a little fishing village at the northern end of one of Mumbai’s most well-known seaside promenades—Carter Road. Egrets crowd the shaft along the roof of the market, with a few gutsy ones hopping around dangerously close to the fish stalls. It is usually a cacophony of mongers talking, yelling and selling in various pitches. Apart from the “Famous Five" quintet of surmai, rawas, pomfret, bombil and bangda, one can find eel, catfish, live crabs, shrimp of various sizes, squid, clams, sardines, anchovies, and more. Due to its peculiar topography, sandy beach and long jetty, Khar Danda is still identified by its small blue and orange fishing boats and long lines of bombil drying on poles. Yet, there is a threat looming large over the future of this village—the proposed 29.2km-long coastal road by the municipal corporation of Greater Mumbai (MCGM) could destroy their very way of life. The road, which will connect to the Bandra-Worli Sea Link, will eat through the mangroves at Khar Danda, an important fish-breeding site, threatening the marine ecology of the area. Mumbai’s Khar Danda fishing village is still identified by its small blue and orange fishing boats and long lines of ‘bombil’ drying on poles. It is a very different scene at Versova koliwada, a few kilometres north of Khar Danda, from where we got our catch of fresh shingala. The once sleepy, centuries-old fishing village across Madh Fort is a bustling commercial fishing hub, its long jetty a docking point for large multi-day trawlers. Although the trawlers have brought new affluence to the community, things are far from ideal—each day, the boats need to go further and further out to sea as the waters around Versova are polluted with untreated industrial effluents. An article published in the Hindustan Times in June 2017 reported that the quality of water at the mouth of Versova Beach was among the dirtiest in Mumbai, with pollution levels 13 times above the normal limit, according to an assessment by the Maharashtra Pollution Control Board. The sea washes up dead fish, along with tonnes of garbage, on to the beach. This is a scenario in which the fishermen with their small engine boats have little or no place. It is up to the multi-day trawlers, with their large engines and giant nets, to go out into the deeper waters for catch. What comes along with the bigger fish, however, is a large number of by-catch and undersized juvenile fish, which poses a huge threat to the future of fisheries. 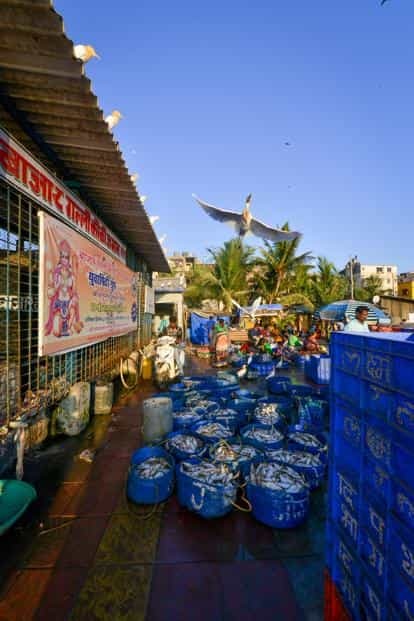 Khar Danda and Versova are but two of Mumbai’s fishing villages, presenting their own problems and challenges in the changing dynamics of seafood production and consumption. As one of the largest coastal cities in the country, Mumbai is a great case study on the effects of industrialization, modernization, overpopulation and pollution on fishing communities. Of course, other seaports and cities have their own histories, but Mumbai’s position as an urban fishing centre, with an economy and culture historically based on the profession, offers some broad narratives on the overall health of Indian fisheries and fisherfolk. And the city spotlights the larger conversations in different fishing centres about sustainability, overfishing, and the health of the ocean. Marine researcher Siddharth Chakravarty believes that the term “sustainable" today is seen as a combination of economics, livelihoods and the environment; one which provides a win-win-win situation. “I do not agree with this definition at all. True sustainability would imply putting primary food producers of this planet—the fishers, the farmers, the landless cultivators—at the centre of our food systems and putting democratic control back in their hands. Once we’ve done that, we have a chance to reimagine the production of food that works with nature, that supports local economies, and one that provides nourishing and culturally appropriate food. That would be true sustainability," he says. Most experts agree on the dangers of overfishing and out-of-season fishing, but the problem is complicated by issues of livelihood of the fisherfolk and an ever-increasing demand for seafood, as well as industrialization, pollution and land encroachment in coastal areas. Going forward, there just may not be any fish left in the sea—and this will affect everyone, from fishermen to fishmongers and consumers. Chakravarty says the term overfishing itself is problematic; it is often used as though it exists in a vacuum. “We realize that what is happening at sea is actually a culmination of various drivers, from marginalization and oppression to governance and management," he says. According to a Central Marine Fisheries Research Institute paper presented in 2013, Responsible Marine Fisheries: Reflections From Maharashtra, by V.D. Deshmukh, a principal scientist at the Mumbai Research Centre of CMFRI: “Decadal compounded annual growth rate (CAGR) of marine fish landings despite increasing at an annual growth rate of 3.2% from 1961 to 1990 slowed down to 0.41% during 1991-2000 and recorded negative growth rate (-4.7%) during past decade (2001-2010). The contribution of the state to total marine fish landings of India also declined from 19.6% in 1971-80 to 12.6% during 2001-10 and its rank in the total fish production slipped from 2nd to 5th in the country in 2012." Fishermen unload fresh catch at the Versova jetty. The paper added that an assessment of 25 types of stock in Maharashtra showed that (barely) 8% were abundant, 28% less abundant, 56% declining, 4% depleted, and 4% in a collapsed state. An analytical assessment of 36 species of commercially important finfishes, elasmobranchs, crustaceans and cephalopods showed that 60% of the stock is over-exploited. One problem is culinary. It is the snobbery around super-sized crustaceans—the large silver pomfrets and the spiny lobsters—that ensure the highest demand for these. They are often displayed in the live aquariums of specialized seafood restaurants across Mumbai. Demand for them far outstrips that for the smaller and less glamorous species, which are rich in flavour and diverse in the ways that they are prepared by communities across the state. A few pioneering chefs and fine-dining restaurants in Mumbai are taking small steps to address this issue. Important players in the sustainable seafood conversation, they are trying to lead by example and make sure that the fish they serve is sourced according to best practices. “With climate change, mass pollution of our oceans and overfishing, it is important for chefs to be continually educated about what’s happening in our oceans, rivers and seas. 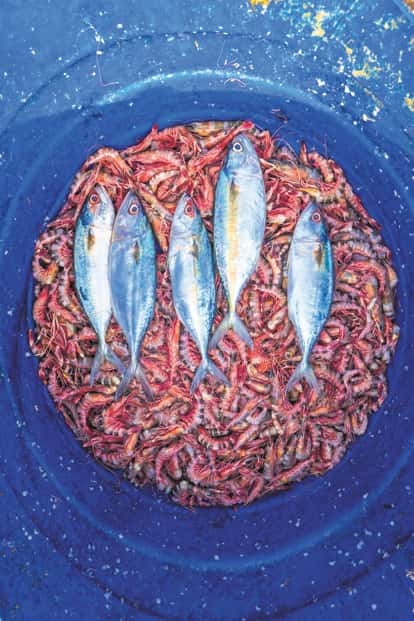 Sustainable seafood means making responsible and conscious choices that have the least impact on our seafood ecosystem without compromising on the quality of the food offerings at restaurants," says Thomas Zacharias, executive chef of Mumbai-based restaurant The Bombay Canteen. He believes many restaurateurs are either unaware of, or completely oblivious to, the reality of the fishing situation. One effect of this over the last several years has been the increase in prices of seafood due to overfishing. “This is one of the leading causes why several restaurants (including local Malvani ones) switch to cheaper imported fish like basa," says Zacharias. For him, the question is not about whether these local fish can find space on fine-dining restaurant menus, but whether they should. “The answer is a resounding yes. The seafood options in both The Bombay Canteen and O Pedro are strictly local. We have such a great diversity of seafood in our waters, and, hence, it’s completely unnecessary and irresponsible to look elsewhere or source seafood from abroad." On 19 February 1991, under the Environment (Protection) Act, 1986, the Central government issued a notification declaring the coastal stretches of seas, bays, estuaries, creeks, rivers and backwaters that are influenced by tidal action as a coastal regulation zone (CRZ) and imposed restrictions on setting up and expanding industries, operations or processes. The notification had been amended 25 times before being revised in 2011. Day’s catch in a fisherman’s bucket at the Versova jetty. The second CRZ notification, of 2011, was aimed at ensuring “livelihood security to the fisherfolk and other local communities living in the coastal areas, to conserve and protect coastal stretches, its unique environment and its marine area, and to promote development through sustainable manner based on scientific principles taking into account the dangers of natural hazards in the coastal areas, sea level rise due to global warming". The notification also restricted the setting up and expansion of any industry, operations or processes, and manufacture, handling, storage or disposal of hazardous substances, in the CRZ. On paper, this was a landmark victory in environmental legislation designed to protect the country’s 7,500km coastline. Yet the gap between the regulations and their implementation has taken a toll on the coastal ecosystem, threatening the local Koli fishing communities, eroding the coastline and driving the fish further out into the sea. In June 2014, the Union environment ministry appointed a panel led by Shailesh Nayak, then secretary in the ministry of earth sciences, to look into issues related to the 2011 notification. The report was released nearly a year and a half after its submission, on an RTI application by Kanchan Kohli of the Delhi-based think tank Centre for Policy Research. While this report again offered a plan for further amendments, individual proposals for commercial development in coastal areas were reviewed by the Maharashtra Coastal Zone Management Authority (MCZMA) and permission given for commercial development in coastal areas. Take, for example, the case of The Indian Hotels Co. (the group that runs the Taj hotels). It can move ahead with its plan to construct a 30-storey hotel on the site of the erstwhile Bandra icon, Sea Rock Hotel, which was damaged in the 1993 blasts and is just across the road from Taj Lands End. The group also plans to build a bridge to connect the two properties. In April, a draft notification issued by the Union environment ministry sought to open up the coastline to reclamation and development. Government projects like the $120 billion (around ₹ 8 trillion) Sagarmala programme plan to set up new mega ports as well as set in process a long-term industrial development plan of coastal economic zones across India. This would take forward Prime Minister Narendra Modi’s Pradhan Mantri Awas Yojana, or housing for all project. With the amendment of CRZ norms, the plan for redevelopment and expansion of slum housing in and around the coastal areas of Mumbai would be able to go ahead full steam. It would come as a boon for tourism and real estate enterprises. This proposed amendment, while part of the government’s narrative of progress, will obviously have an impact on fishing communities, in the state and the country. Sorting fish at Sassoon Docks in south Mumbai. For Chakravarty, the first CRZ notification of 1991 was an outcome of the iconic march along the coastline by fisherfolk. “The second CRZ in 2011 was, once again, a result of years of resistance, protests and marches undertaken by fish workers, with the support of civil society. The state was forced to listen and to engage with the fish workers when drafting these policies," he says. Chakravarty says it is important to realize that the CRZ notification is under the ambit of the Environmental (Protection) Act, and, at the same time, guarantees the livelihood rights of fish workers, meaning it encompasses protection to the ecology and to the people. “While the existing CRZ, 2011, has been violated repeatedly, in addition to it being diluted, the new CRZ, 2018, makes it clear that the coastline has no place for traditional livelihoods and customary rights. The draft notification stands to serve only one purpose and that is to transform the country’s coastline into a launch pad for the new Sagarmala economy," says Chakravarty. He says we need to accept that coastal-intensive development across the range of infrastructure for ports, factories, urban amenities and tourism is the reason coastal and marine ecosystems are in decline. The result of this is, of course, well-documented: a drastic reduction in the amount of fish available in the sea, and diminishing returns for fisherfolk. “Livelihoods which rely on natural resources are increasingly under attack, with policies being oriented to cater to the free market," Chakravarty says. One of the biggest threats to sustainable fishing comes from trawlers, commercial vessels operating large nets. While these enable economies of scale, they also end up damaging the sensitive ecological balance. Fishing trawlers drag giant nets along the floor of the sea (or, sometimes, at a fixed depth) to catch fish. “The nets used are heavy-duty, with a small mesh that can carry a huge weight of fish (in tonnes, usually)," says Divya Karnad of In Season Fish, a Chennai-based outfit that is encouraging people to consume fish that is caught sustainably and in season. On any given day in Mumbai, trawlers are a familiar part of the early morning view at Sassoon Docks, one of Mumbai’s oldest docks and a major landing point, auction site and fish market located at the city’s southern tip. With over 1,500 trawlers bringing their catch to these docks, Sassoon is a hub for the fishing business in Mumbai. On our visit, we spotted different kinds of trawlers, with intricate equipment, docked around the broad jetty as men carried the larger fish in sturdy plastic containers. They tossed heavy baskets from the boat to associates standing on the jetty with the dexterity born of years of practice. Smaller fish from the trawlers are thrown, sorted and cleaned into large piles by female fishmongers. During the process of trawling, entire shoals of bottom-dwelling fish, many of which have low value in the market, are caught. Given the large mass of fish picked up by trawlers, it becomes difficult to sort out the juvenile fish and throw them back into the sea. Many of them suffer injuries and die. But though trawling is a big threat to sustainability, Karnad agrees it is not possible to ban it outright—trawlers remain a major source of income and employment in the fisheries sector. According to the Marine Fisheries Census 2010, Maharashtra alone had 5,613 trawlers. A fisherman sorts his stock at the Versova jetty. “I am not against trawling. I am against the number of trawls. 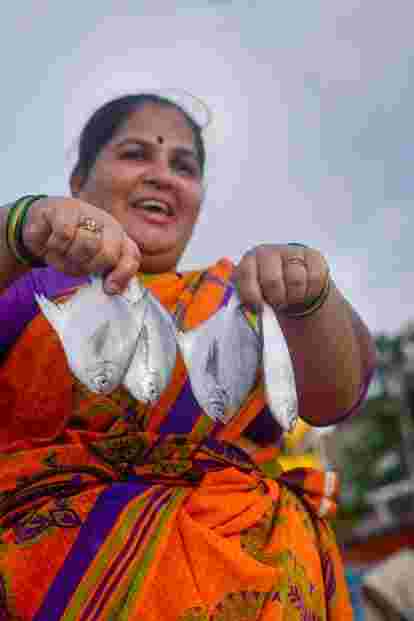 There are only so many fish in the sea," says S.G. Raje, a Versova-based marine scientist. In the high season (September-January), he explains, trawlers in Versova go out for four days to a week. During lean periods, they are out for up to 20 days. “As a result, many of the smaller fish that are caught are decaying by the time they reach the jetty," says Raje. According to Akhilesh K.V., a scientist with the CMFRI in Mumbai, it is quite simply a race to bring in more catch and try and meet the ever-increasing demand for seafood for a growing population. It is a basic equation, where more boats mean less fish per boat. “Earlier, we used to get a catch of, say, 10kg per boat. Now, the number of boats has gone up, so that same 10kg is being shared by many boats and the catch per boat has declined, which is generally not economically efficient," says Akhilesh. No longer, perhaps, do the lyrics of this popular Koli song ring true: Valhab re nakhwa, ho valhab re rama/ mi dolkar dolkar dolkar daryacha raja/ ghar panyavari bandarala karto ye ja (Row the boat, oh Nakhwa, row it oh Rama/I am the boatman, I am the king of the seas/Since I am the boatman, my home is on the water and I keep moving to and fro between the port or the jetty and the sea). In a paper, The Kolis Of Mumbai At Crossroads: Religion, Business And Urbanisation In Cosmopolitan Bombay Today (2008), Sanjay Ranade, associate professor, department of communication and journalism, University of Mumbai, writes that until the 1950s, the city’s Koli fishing community continued with its traditional occupation, fishing with boats fitted with small engines capable of going out to sea for one day. In the late 1950s, the government came up with a loan scheme that helped these fishermen to buy as well as build their own trawlers. They also got diesel subsidies to run them. Cooperatives known as Nakhwa Sanghas owned the boats and helped the fishermen get subsidies. But the system did not work smoothly and delayed reimbursements from the government meant that both owners and fishermen were under pressure. The fallout was obvious. “The Kolis responded to this pressure by keeping their trawlers at sea longer and going to sea further in order to maximize the size of the catch. In the end, the government subsidy and the pressures it caused completely changed the fishing cycle and disturbed the marketing chain. The situation was exacerbated because the other Koli villages in and around Mumbai’s coast began to make their own trawlers. Gradually, the catch per boat went down because so many large boats were fishing in the same area," writes Ranade. The small-scale fisherman has had to adapt to the pressures of large trawlers. In a study, published in Oryx—The International Journal Of Conservation in 2011, scientists interviewed fishermen across 39 villages in Ratnagiri and Sindhudurg districts. Eighty-five per cent of them reported a decline in fish catches and most of the small-scale fishermen surveyed blamed trawl fishing for this. As a result, 25% of them had had to change fishing gear and techniques, while 67% of the fishermen in Maharashtra had had to start fishing over a larger area. 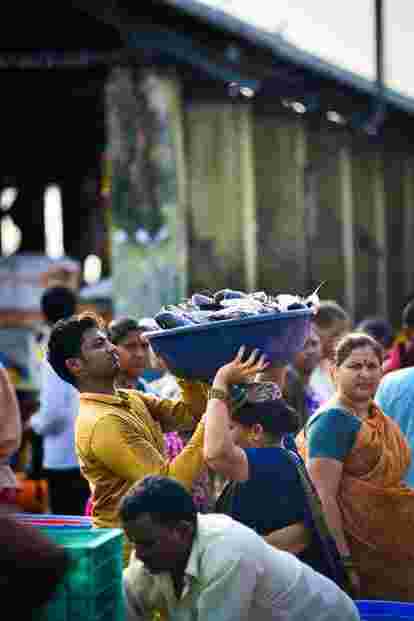 Line-caught fish is rare in Mumbai. In Vasai’s Pachu Bandar fish market, we spotted a large sea bass, its jaw frozen in an angry grimace. This 7kg line-caught sea bass was auctioned for ₹ 4,500—more than the routine transactions of small fishermen. Despite best practices, then, line-caught fish remains a high-end luxury product. In Mumbai, different fishing villages catch different kinds of fish. Raje explains this. “The geography varies, and in some villages, fishermen are not competing with the big boats that can only anchor in jetties that are deep enough." Cuffe Parade’s fishing village is, for instance, home to smaller boats manned by fishermen who largely use gill nets (these nets allow fishermen to catch fish of specific sizes as their meshes are specific to that fish and therefore make it easier to free the by-catch). Catch comes in small plastic baskets from skiffs that ferry them from larger boats docked less than 100m away. Sea crabs scramble around and rock lobsters drowsily click their claws while a medium-sized grouper fish takes its last breaths. A concrete jungle surrounds this gently sloping bay stretching from Mumbai’s Nariman Point to Cuffe Parade. Fishing boats unloading for auction at Sassoon Docks in South Mumbai. 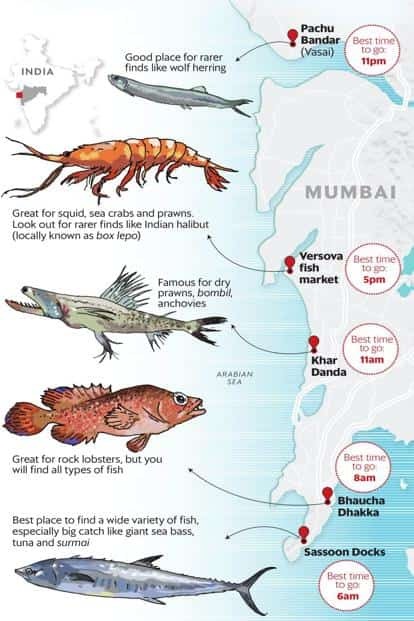 According to Karnad, the freshness of the fish arriving at Cuffe Parade is a clear indicator that the boats have only been out for a few hours in the sea. In Khar Danda village, for example, “people mostly catch prawns and small fish and that village is well known for producing dry shrimp and dry fish," explains Raje. In tropical waters, fishing is almost exclusively multi-species. So, if a boat sets out to try and catch one kind of fish, it will inevitably catch several other fish too. But while trawling is detrimental to the ecosystem, some of the older fishing techniques that have traditionally been practised along the western coast are less harmful. In 2017, the CMFRI estimated that out of Maharashtra’s 380,000 tonnes of catch, most comes from trawl (56%). Dol net (20%) and purse siene (16%) come next. Gill net (7%) is less common, and only 1% of the catch is hook-and-line caught. Dol nets, preferred by the smaller fishermen of Maharashtra and Gujarat, are attached to a pole in the sea, or the anchor of a boat, and act almost like a sieve, filtering fish into them. At the Sassoon Docks fish market. Sassoon Docks, built in 1875, makes its olfactory presence felt long before you actually arrive there. Schooling fish like sardines or tuna are caught via purse siene nets. This form of fishing picks up fish in bulk, including fingerling or juvenile fish and eggs. This is the reason the Maharashtra government banned it in January 2017. Karnad says hook-and-line fishing is the best possible technique. “Each hook can catch only one fish," explains Karnad, adding that the size of the hook also determines the size of the catch. It is this varied catch, all the myriad sizes and shapes, that greets us when we visit Sassoon Docks at dawn one Friday. Although it is only 6am, the lorries are already half-loaded with fresh catch for various corners of the city. As the auction ends, with buyers and sellers crowding around the prize catches, crowds disperse in several directions. The aftermath of a lively fish auction at Sassoon Docks can be quite alarming. Baby pomfret, 2 inches or less in size, can be found by the wayside in the company of prawn shells, fish gut, blood and dirt. Giant baskets of tiny bangda (mackerel) looking completely devoid of flesh lie waiting to be processed as low-value tinned seafood. The ground at the Sassoon Docks is always wet and the smell is unmistakably that of the sea and its fish. Sassoon Docks, built in 1875, makes its olfactory presence felt long before you actually arrive there. The ground is always wet and the smell is unmistakably that of the sea and its fish. At the 2017 St+art Urban Art Festival, which offered artists a chance to interact with the culture of the docks and the city, artist Sameer Kulavoor’s humorous art installation, the Parfum Sassoon, was a hat tip to this unique smell. The jetty at Sassoon Docks is all about doing quick business and cracking deals. There is surprising structure to the chaos as well as a gendered hierarchy. While the men do the fishing and the hauling of the catch, it is the women who largely sell the fish, striking deals depending on their mood and time of day. The maushis selling prawns are closer to the entrance, while those selling lobsters sit next to counterparts with baskets of squid, bombil and mandeli (golden anchovy). The tuna enclave is about two-thirds of the way in, along the central aisle, and sellers and touts can often be seen haggling over giant specimens of yellowfin tuna. In stark contrast to Sassoon Docks is the boutique store Off The Hook, in Mumbai’s upmarket suburb of Bandra. This is another world altogether—stainless-steel countertops, staff clad in lab coats, and vacuum-sealed fish sliced or filleted to choice. Junaid Daruwalla, owner of the store, is also worried about the changing fish demographics. “Although there is no species which has been wiped out as yet, catches are declining every year. Another alarming thing we are seeing is a decrease in the sizes of the fish. Earlier, the pomfret, which is a premium fish in the Mumbai market, would come in a healthy mix of sizes. Now the large-sized pomfrets are less common." Fish being prepped up for auction at the Sassoon Docks fish market. The jetty at Sassoon Docks is all about doing quick business and cracking deals. Kunda, the owner of a fish shop in Khar, is always immaculately turned out in bright saris, bangles and perfectly kohled eyes. A local fixture at the Khar Danda fish market, her stall is nearly spartan in comparison with Off The Hook. Ice boxes of fish are stored in the back and the gleaming concrete slab forms the cutting board as well as display case for her fish. The discarded bones and leftover heads are stacked in another corner. Given her experience of fish that has been coming to the Khar Danda market, she says: “These days the big pomfrets are no longer being sold in local markets. They are largely exported since they fetch a better price outside Mumbai." Kunda says the kind of fish people buy and eat often depends on the communities they belong to. “For example, some of the local Marathi people around here love eel," she says. Other hot sellers at the Danda market are karli and mandeli. However, these fish, largely eaten in homes, find little resonance in restaurants. “These days the big pomfrets are no longer being sold in local markets. They are largely exported since they fetch a better price outside Mumbai. Thankfully, despite Mumbai’s seafood obsession, there is a traditional pattern of consumption drawing on familial wisdom which ensures that most families tend to avoid certain kinds of fish in the months without an “r" in them. Traditionally, the Koli community would also stop fishing during the monsoon, resuming only after the Nariyal Purnima festival, which marks the end of the rainy season. This idea has been institutionalized with the government’s seasonal fishing ban on trawlers and deep-sea fishing for 61 days from 1 June-31 July on the western coast. Chef Manu Chandra was one of the early players to realize the importance of sustainable seafood. He sought more reliable and established suppliers, who got things directly from source. “Using the Indian fisheries guide, it was easy for me to be able to figure the varieties and the seasons they were available in; it was also a reliable cold chain, ensuring the product quality isn’t compromised. I’d also be told if a stock-keeping unit was frozen or not. I was particular in insisting that we not get any trawled fish, and ran varieties like reef cods extensively, as well as line-caught tuna and sea bass. Some things were farm-raised too," says Chandra. Fisherfolk at the Sassoon Docks fish auction. While the men do the fishing and the hauling of the catch, it is the women who largely sell the fish, striking deals depending on their mood and time of day. For him, though, the biggest challenge is sourcing high-quality seafood. “I’m not one to wax eloquent on the small-time fisherman because the rules of the sea and the effect of poor economic decisions are the same for them as anyone else. They will catch and sell, because they have to, to make ends meet, and the process is far from sustainable and ethical. The big companies, meanwhile, will continue to take the big catch and feed the rest of the world, who have plundered their own. The fish trade is a global one, and one that humans are losing. Some of us are fortunate/privileged enough to tap into great sources—and that forms a bulk of my supply chain. From excellent tuna from Lakshadweep, snapper and sea bass from Kochi to crabs from Andhra and calamari from Tamil Nadu, of which all are export grade. The challenge remains the cold chain, and consistency, but we’ve been able to ride over that for the most part," he says. In the Mumbai outpost of his East Village-style fine-dining restaurant Toast & Tonic, a new menu, the Dockyard Chronicles, celebrates seafood, with dishes that include locally sourced clams and lobsters as well as oysters from Vengurla in southern Maharashtra. Traditionally, the Koli community stops fishing during the monsoon, resuming only after the Nariyal Purnima festival. Most of the younger crop of chefs are very aware of the seasonality of seafood. Apart from reducing the low-value and juvenile fish catch, an awareness of seasonality is a crucial aspect of sustainability. Outfits like Know Your Fish and In Season Fish, where experts regularly collect data to understand the vulnerability of fisheries, have helpful guidelines and calendars explaining which seafood should be consumed when. These are baby steps in the right direction.